Oculus Pentacam® HR | Blue River Medical, Inc. Within a mere second the Pentacam supplies you with precise diagnostic data on the entire anterior eye segment. The degree of cataract is made visible by the light scattering properties of the eye lens. Measurement of the anterior and posterior corneal surfaces supplies the true total refractive power of the cornea. The data on the posterior surface gives you just the assistance you need for early keratoconus detection. The rotating scan supplies more data points in the centre of the cornea. A supplementary pupil camera corrects for eye movements during the examination. Unlike conventional topography systems the Pentacam measures true elevation data rather than just curvature values. With its brighter and optimized optics the Pentacam HR offers you brilliant image quality. The resolution of its images is five times that of the Pentacam Basic or Classic models, enabling the Pentacam HR to deliver impressive representations of IOLs and phakic IOLs. Corneal irregularities as well as injuries, implantations and refractive interventions are made amazingly visible. Additional imaging modes such as the cornea fine scan serve to reveal intracorneal pathologies. The Pentacam HR is equipped with a software package that leaves nothing to be desired. 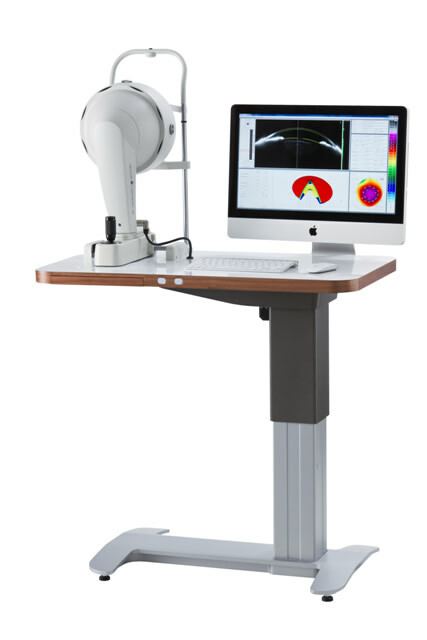 In addition to the basic software you receive software packages for refractive surgery and cataracts, PNS (Pentacam Nucleus Staging) and cataract analysis, the Holladay Report and the contact lens fitting module. Two software licences are also included so that you can integrate the Pentacam HR into your patient management system. In order to be able to read and process data gathered by the Pentacam without the instrument itself, you require a software licence for this workplace. The Pentacam basic software is included in every software licence. It can be freely extended by you. The software licence is not dependent on the instrument, i.e., you can also use it to read data from examinations conducted with other Pentacams. The Pentacam Classic and HR include two software licences as standard features so that nothing impedes your efficient work processes.